Not the best the franchise has to offer, but still has enough fun for any to enjoy. When the first Despicable Me film was released, I didn’t care for it at first but it grew on me. Then as the sequel came along, I found that one to be much better and is my favorite out of the bunch so far. Now we get to the latest one in Despicable Me 3, which isn’t the best of the lot, but still manages to have enough fun and laughs for anyone that joins in on this adventure. Once again we enter into the life of former supervillain Gru (Steve Carell) who has now become a secret agent of sorts with Lucy (Kristen Wiig) who is now his wife. When the two aren’t going on adventures and saving the world, they spend time with their girls Margo (Miranda Cosgrove), Edith (Dana Gaier), and cute little Agnes (Nev Scharrel). Upon waking up one morning, a man comes around looking for Gru and informs him that he has a brother, Dru (also voiced by Steve Carell) that’s been searching for him. Not believing it at first, Gru decides to go along with Lucy and the girls in tow, and discovers it’s true as Dru is the complete opposite of Gru as he’s happy, fun, and has long flowing hair. He also takes Gru down to his secret lair and shows him he’s also a supervillain in training as they’re both descended from a family of villains. 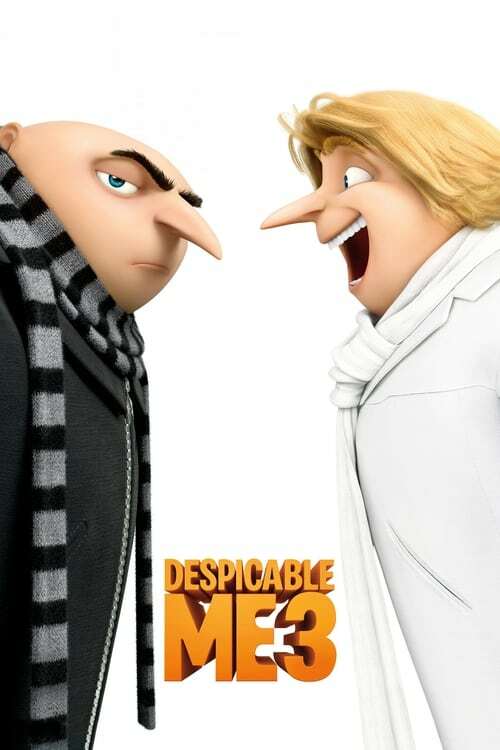 Not wanting to go along with it since he’s changed his ways, Gru eventually lets his brother talk him into testing out some villain gadgets, and he manages to trick Dru into thinking they’re going to steal the world’s biggest jewel. Turns out it’s in the hands of a supervillain that used to be a child star in the 80’s named Balthazar Bratt (voiced by South Park’s Trey Parker) that Gru and Lucy were trying to capture earlier. Add in Gru trying to keep this from Lucy and the girls, and Gru’s Minions wanting to do evil again and turning their backs on him, and there’s enough misadventures for all involved. Despite not being as funny as the second entry, I had a good time with this one mainly in part of Trey Parker’s performance as Balthazar Bratt. I’m pretty sure he had some input on the creation of this character, as he looks and acts like someone straight out of a South Park episode, complete with 80’s-themed weapons such as square-shaped gum that can trap people with its stickiness, to a semi-deadly Rubik’s Cube. Watching these misadventures in 4K UHD and HDR color was a nice bonus, as everything looks and sounds perfect thanks to the enhanced details to the visuals and audio. There’s also a nice amount of special features to take a look at, such as “Character Profiles” that has some interviews with the cast and their thoughts on the fun characters they voice, “The Making of” is you guessed it…the making of the film with the cast and crew discussing some of what went into making it. “The Secret Life Of Kyle” is a fun short starring Gru’s dog, “Minion Moments” are two quick shorts starring the Minions doing what they do best, bringing laughs with their antics. There’s also a Sing-Along to Pharrell Williams’ song “Doowit”, a music video for Pharrell’s “Yellow Light”, a deleted scene and a few more extras that will keep viewers busy for awhile. Despicable Me 3 manages to contain enough fun and laughs for any that watch, though I still love the second entry more. You’ll still find yourself chuckling at most of it, and the minions don’t hurt with bringing the laughs too. But it’s Trey Parker’s role that tends to steal the show and will have viewers dancing and cheering whenever he jumps or moonwalks onto the scene. So go ahead and grab this for your minions for family night in 4K, and prepare for some double trouble with Gru and Dru.